May 27, 2018 at 12:07a.m. Today is the last day to enjoy the food, music and fun at the Greek Festival at St. John The Forerunner Greek Orthodox Church. 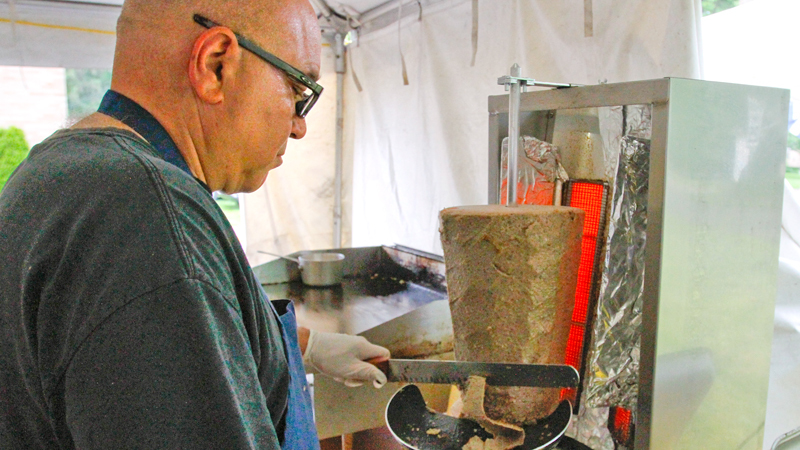 The final day of the 42nd annual festival, known as Glendi, a word for a Greek party, runs from noon to 10 p.m. at the church, 4955 Glenwood Ave., near Shields Road. The festival is one of two major fundraisers the church puts on in the spring. The other is a Seafood Fest during Lent, said Gregg Giannios, owner of Giannios Candy Co. in Struthers and head of the festival’s kitchen operation along with his wife, Ann. Giannios said volunteers – two each for the pastry, the outside food and the bar, and other volunteers – are what make the festival a success. Eugenia Pontikos, a special-education teacher at Youngstown Kirkmere School for 25 years, has also baked for the festival for the same amount of time. Deanna Vallos of Boardman, a church member, who grew up in St. John’s, explained why she works at the festival. “This is my upbringing. I like to see people come and enjoy the good food, pastries, Greek music and good drinking,” Vallos said with a laugh. Foods served outside under a tent include gyros, souvlakia, lamb on pita, saganaki, French fries and calamari. Among the “Youngstown area friends” Father Constantine mentioned were Eduardo and Amanda Mateo of Poland, a young couple who said they have patronized the festival for about three years. “We love the food – especially the gyros and baklava,” said Amanda, who noted that they also took a variety of desserts home. September 7, 2014 12:06 a.m.
September 2, 2018 12:07 a.m.